Didn't I say the other day that anything could happen? And, it did! Heikki, a Finnish reindeer specialist who works for the University of Alaska came to see us Monday evening together with a colleague of his, a young Frenchman by the name of Tibo. Heikki had to fly to Fairbanks the next day but Tibo promised to take us musk ox viewing. Although the weather was miserable as it has been every day since our arrival, we managed to see two herds of musk oxen; one out in the bushes and the other one just outside Nome when coming back from an old gold digging dredge. The original musk oxen of the Seward Peninsula were hunted to extinction in the 1800's, but the 70 animals that were introduced here about 30 years ago have grown to a population of more than 2,000! 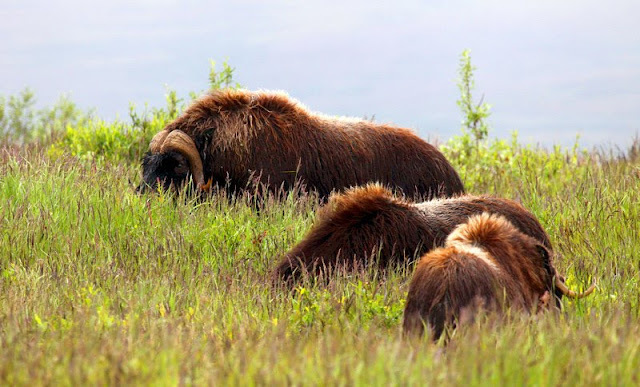 Residents are allowed to hunt the musk ox seasonally but for this, they require a special licence. And to secure the future of the animal, hunting is strictly controlled. We also heard a strange but true story about the caribou and the reindeer. There used to be twenty something reindeer herders in the area but today, only five are left. The main reason for this is that the caribou are stealing the reindeer! Being closely related genetically, the reindeer easily integrate into caribou herds. And when the caribou migrate, the reindeer go with them. 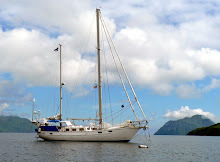 Later the same day, a local couple, Susanne and Hugh, came to our boat. They had seen our message on the community website, placed there by an employee of the Nome Visitors' Centre, saying that there were two Finnish sailors at the boat harbour without a rental car, and they were willing to take us sightseeing. Since we had already been in the countryside that day, we agreed to meet Susanne the next morning. Nome's road system consists of three main roads, each extending about 75 miles into the countryside. At the end of each road is a community; Teller, Kougarok, and Council. We took the road that follows the coast of the Bering Sea northeast and then turns inland towards the community of Council. We drove all the way to the Niukluk River that crosses the entrance to Council. It was a lovely ride although, except for the odd rabbit and ground squirrel, local wildlife had clearly taken the day off. The scenery was spectacular alternating between flatlands, tundra, hills and mountains with patches of spruce trees, and winding rivers with crystal clear water and spawning salmon. 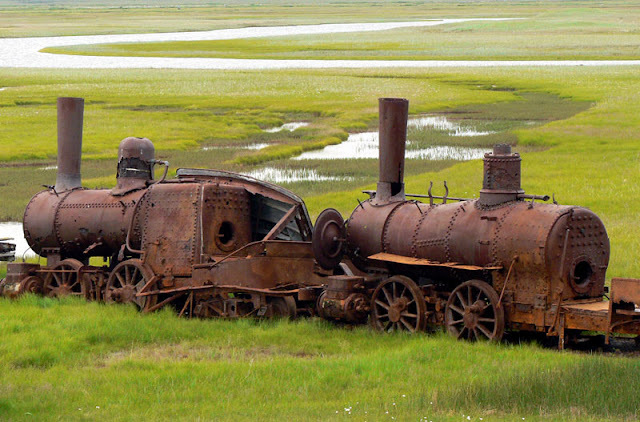 Along the way, we saw Eskimos' summer camps, remnants of the gold rush, dilapidated dredges, and also the amazing Last Train to Nowhere, abandoned in the tundra back in 1907. The northerly winds continue, and our stay in Nome is prolonged, accordingly. On the basis of the latest weather forecast, the direction of the wind should change and become more favourable for us. If that happens, we should be on our way to the Northwest Passage by the beginning of next week. Using Car Rental 8 you can discover the most affordable car hire from over 50,000 locations worldwide.